Football has always been important to my husband. When we were engaged, he begged me to give football a chance. He told me he wanted to go to a college football game and he would spend the game explaining the rules to me and as soon as I could explain the game to him, we could leave. I went to the game with every intention of being a quick study and being out of there by halftime. As the first quarter came to a close, he told me we could go if I wanted. I told him to be quiet; I was watching the game. Ever since, football has been a big part of our lives. From college to the pros, we watch it all. There is always a moment after “The Big Game” is finished where my husband gets visibly sad because he realizes there is no more football until fall. The struggle is real. We love football and every year throw a party for The Big Game. It is my chance to bring a little bit of creativity to football and my husband loves all the good food. I love shopping at Sam’s Club for all of our game-day essentials because, let’s face it, it’s a long game and I need to buy everything for the party in bulk to keep people feed. Right now, Sam’s Club is doing an amazing offer for The Big Game. Join Sam’s Club for $45 and get a $20 gift card you can use to stock up on all of the essentials for your football party. Print the offer here! You can also check your Valpak envelope for additional information on Sam’s Club Memberships and the savings available to members. 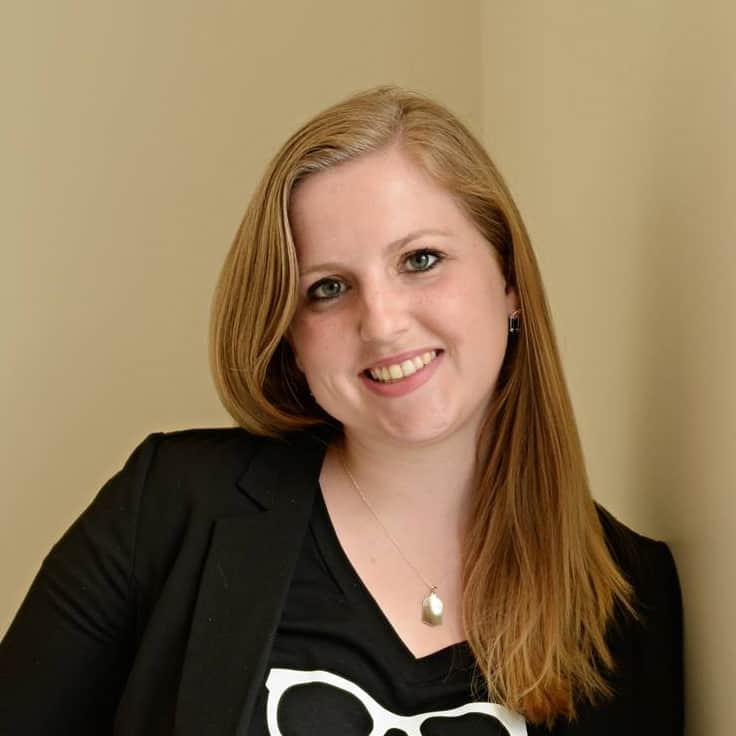 We have been members for 10 years and have LOVED the savings the membership has given us. 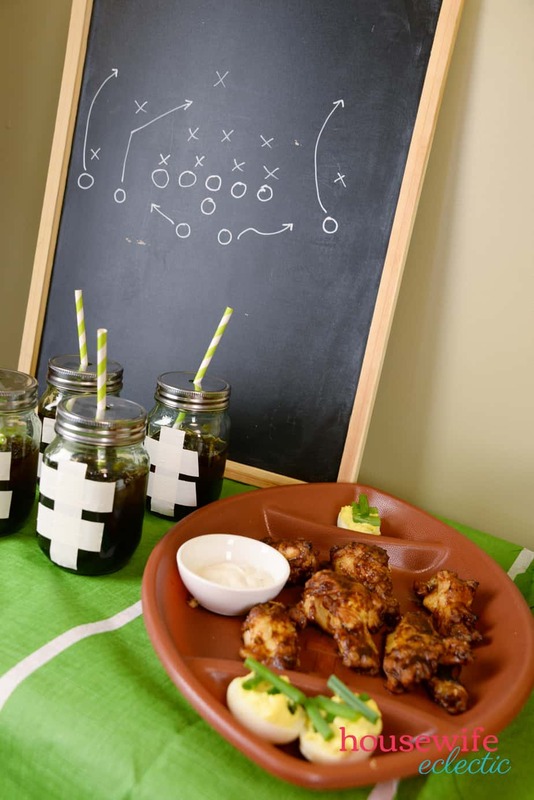 Check out all of our favorite football party ideas below. This balloon upright is one of my very favorite football directions ever. It is really affordable to make and will come together in minutes. Blow up each balloon and tie it off. Don’t blow it up to its full size, just the size of a small soccer ball. Use the masking tape to make an upright on your wall. Tape the yellow balloons along the masking tape upright to cover up the masking tape. 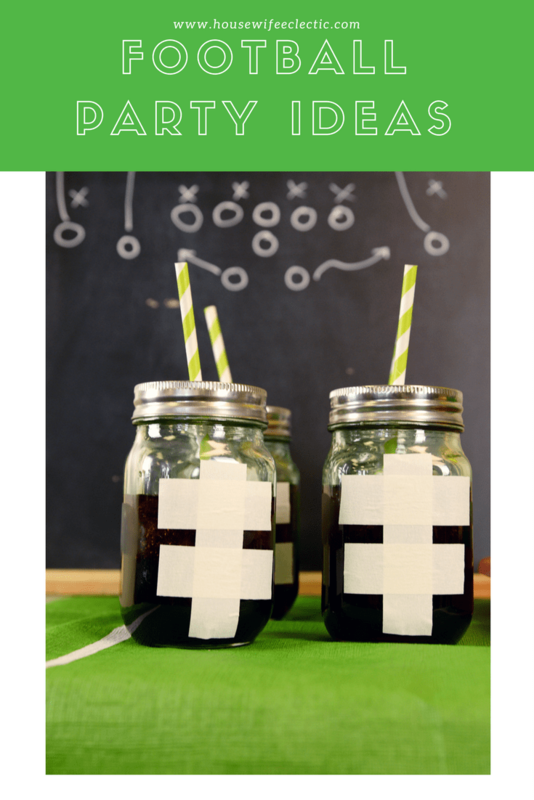 These football Mason jars are one of my favorite things to make for a football watching party and they are SO easy. The best part is you can remove the tape and use the jars for whatever you want in the future. Using scissors, cut a long piece of masking tape and two shorter pieces for each cup. 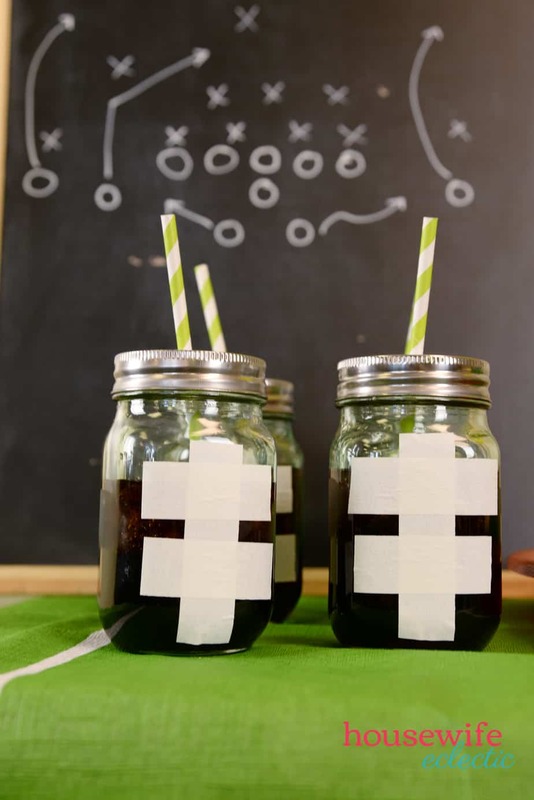 Place the tape on the jars and then fill the jars up with dark soda to complete the football look. This white chocolate M&M popcorn is ALWAYS a hit at our house. It is incredibly easy to make and it would be so easy to dress up to cheer for your favorite team. Just use the M&Ms in your team’s colors. I always buy the big bags of M&Ms at Sam’s Club so there are plenty of M&Ms to go through to find the right colors. Lay your popcorn out on parchment paper and pull out any un-popped kernels. Melt your chocolate in a microwave-safe dish by putting it in the microwave for 30 seconds and then stirring the chocolate. Repeat until the chocolate is smooth and melted. Use a spoon to drizzle the chocolate all over your popcorn. Top with as many M&Ms as you want! Melt your chocolate in a microwave-safe dish by putting it in the microwave for 30 seconds and then stirring the chocolate. Repeat until the chocolate is smooth and melted. Twist the leaves of your strawberry together and then roll the strawberry in the melted chocolate. Melt white chocolate the same way you melted the milk chocolate and spoon it into a plastic bag. Snip the corner of the bag and use it to draw the lines on your football strawberry. Make life easier on yourself as you prepare for your party and pick up a big bag of Tyson BBQ Wings at Sam’s Club. We love to bake them the recommended amount of time, but put them under the broiler for the last couple of minutes to help get them extra crispy. Consider picking up some 5 Hour Energy for yourself at Sam’s Club for the day of The Big Game. Every host or hostess could use a little bit of extra energy to help get through set up and clean up. Set up all your food on a green tablecloth and put up a couple of other decorations if you want. I used a letter board with Keep Calm and Watch Football spelled out on it, and a large chalkboard with a football play written on it with a chalk marker. Overall, I love how this turned out and all of it was so easy! I can’t wait for The Big Game. Now I’m just crossing my fingers that certain teams make it! Want to WIN a Sam’s Club membership so you can pick everything you need for The Big Game? Enter the #SamsBigGame Giveaway hosted by Savings.com. They are giving away twenty $45 Sam’s Club Membership Gift cards, but hurry — the giveaway ends on Tuesday, January 16, 2018. Join the #SamsBigGame Twitter Party on January 16, at 6PM for a chance to win even more fabulous prizes. RSVP here. How do you watch The Big Game? I don’t do much decorating it is all about the game and food. Wonderful ideas. Do Ike those drink glasses. Great ideas! We had a football party last night and my photo booth was a huge hit! I’m always looking for new ideas and you have some good ones. Wings are always a hit if my husband or oldest son are around. I love chocolate covered strawberries, the football decoration is cute. Two of my favorite things – mason jars and masking tape (don’t ask!) and I can easily make this for a great football game celebration. We’re football lovers over here – even if our team isn’t doing well – so we appreciate having good food to go with a good game. These look like really fun ideas. We haven’t seen to a football game party in a long time. These are some fun ideas! I don’t watch football, but I do love to eat. I’d enjoy all of this food. 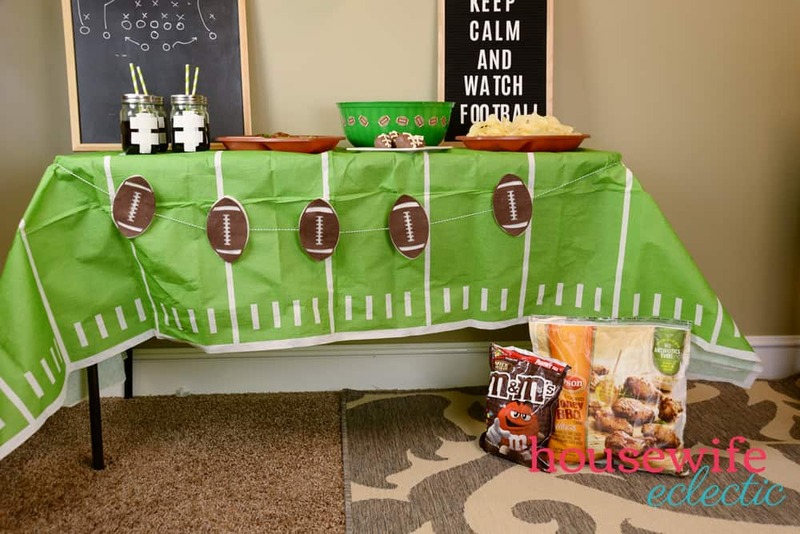 These are such fun ideas for a football party. I love that upright made from balloons. How fun is that! I would totally recreate that in my home. I love the football Mason jars. And the football themed chocolate covered strawberries. What great party ideas. This is the kind of Superbowl party I want to go to! 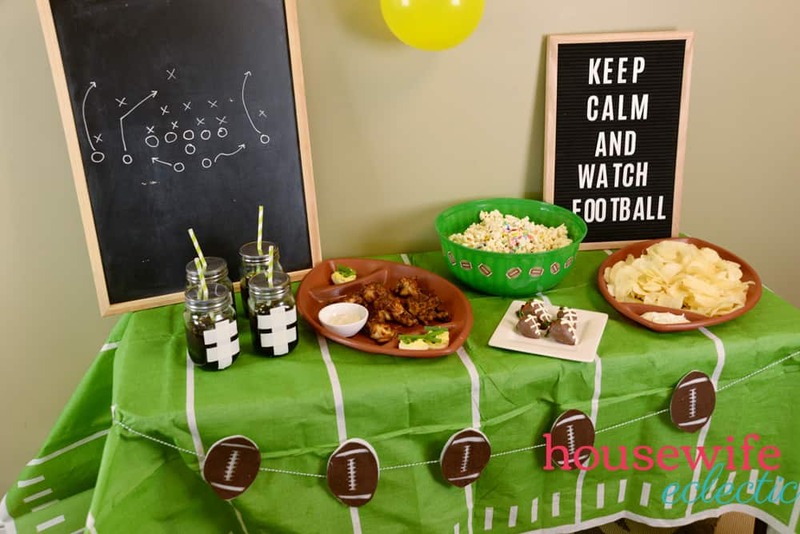 Cute decorations, yummy snacks and a fun time, sounds like game day perfection. 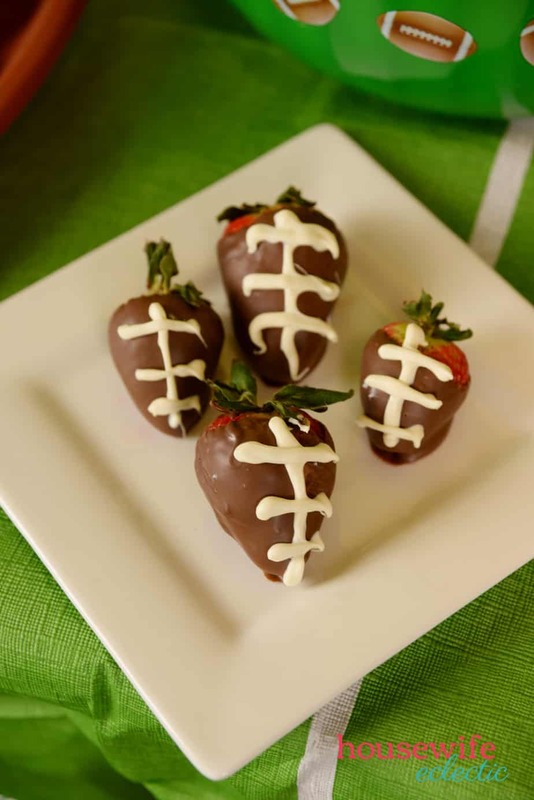 I never thought to do football strawberries with chocolate. What a simple but yummy snack. The big game always falls on my birthday weekend and this year we have a huge party. Wings and signature drinks are always on our game day / birthday menu. Love the goal post balloon decoration. Too cute. We aren’t huge FB people here, basketball is our game. But any excuse for fun and food will always work. I’ve got to do a TV segment in a couple weeks for party ideas so I’m experimenting with some recipes. These are all great ideas! I love all the little details that were included. Those strawberries are awesome! The Football chocolate strawberry looks so tempting. The table is set so nicely and integrates seamlessly with the football theme. Great atmosphere for enjoying the game. I love popcorn and M&M’s! All of these ideas sound awesome. I need to make some wings soon because yours look so good! 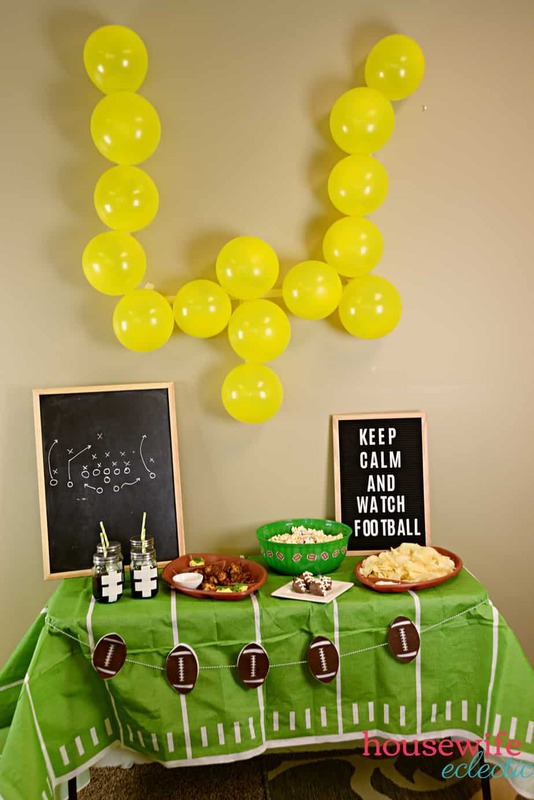 These are some FUN football party ideas!! I need to try a few of these at a game watch party soon!! 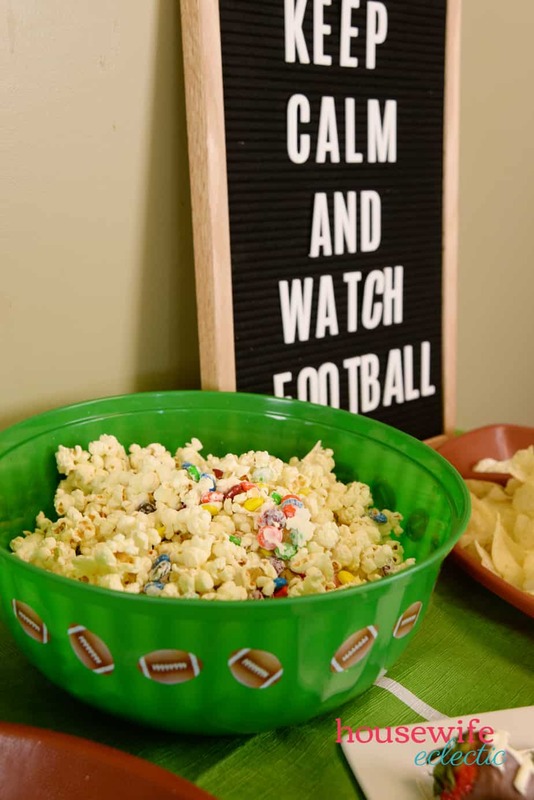 Ohh, we have been looking for some football party ideas and I am glad I already found the best one. I am excited to share this with my friend and start conceptualizing his baby’s birthday party.